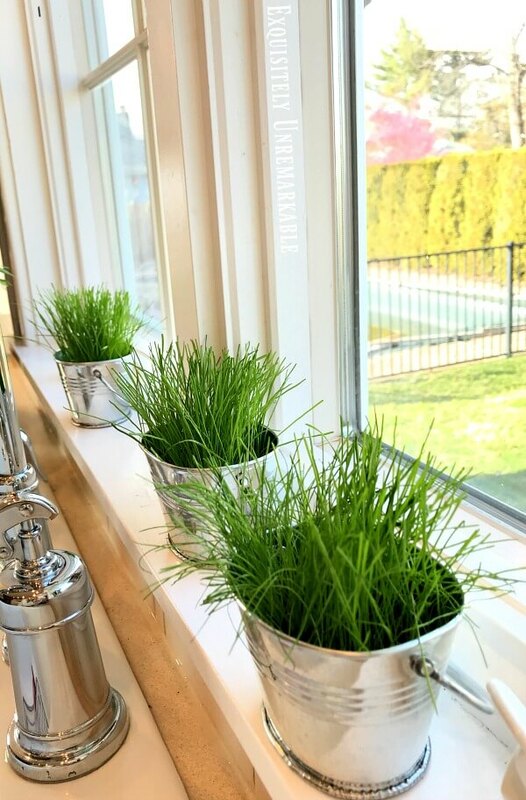 Grow grass indoors in tiny pots for a cottage style or farmhouse kitchen decor accessory. It's super easy to get started and it doesn't take a green thumb to keep it alive. Years ago, I was at Ikea and found the cutest little galvanized tubs. They came three in a pack for something silly, like seventy nine cents. 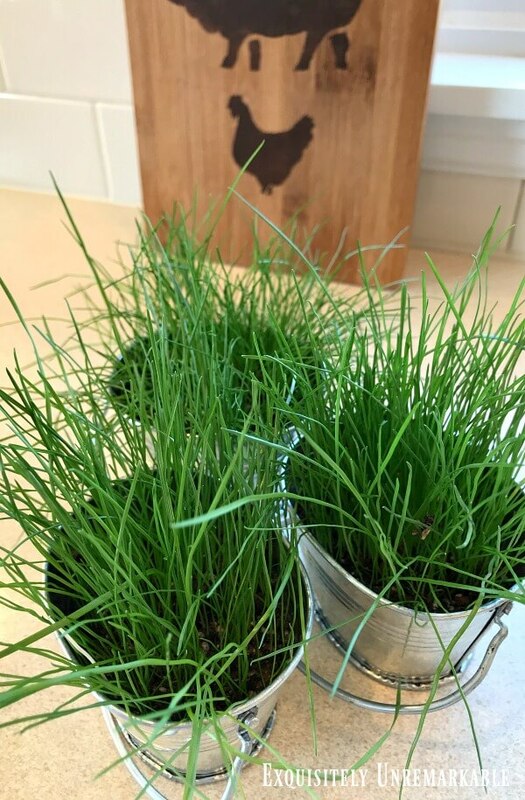 I fell in love, bought a package, planted grass in each one and popped them on my windowsill making the whole kitchen feel fresh. Now we all know I'm not the best gardener, but even I couldn't kill grass. Plus it came up quickly and even better, when it got too long, I gave them all haircuts. Well, after a few years, I lost track of those sweet mini buckets. Every now and then I would drag my husband through Ikea, hoping to find them again, but Ikea merchandise comes and goes and, unfortunately for me, those buckets went. I've hunted high and low for something similar over the years, with no luck...but...about a week ago, I went to Michael's and found a few tubs that were very close. I couldn't believe it. They were tiny enough to fit well in the space and oblong, which was actually a better shape for my newly trimmed windowsill. The only drawback was the price. They were about $3 each. Now, I know that doesn't sound like a lot, but compared to my Ikea price, it was a lot. However, with coupons in hand, I bit the bullet and got out for about six bucks. I brought them home and began planting immediately. To start, I gathered my supplies. 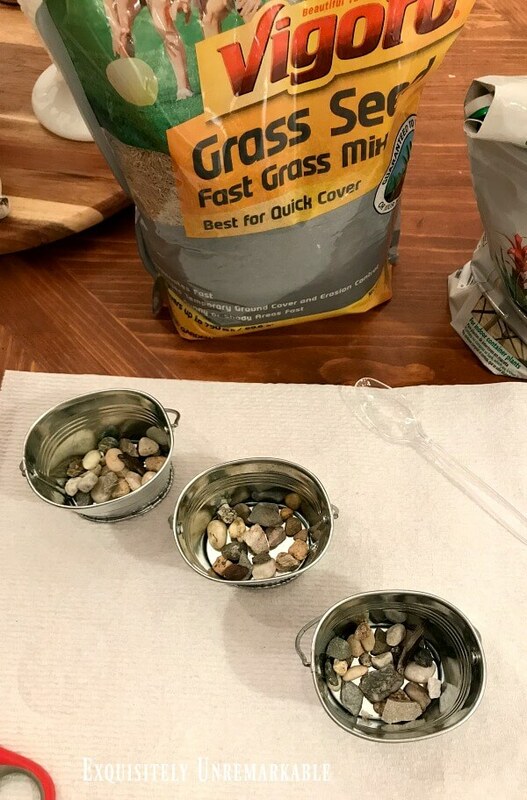 Indoor potting soil, a plastic spoon, a few pebbles and grass seed were all I needed. A note about the grass seed, it comes in many varieties. My yard is full sun, and so is my windowsill, so that's what I opted for. If you have a shady spot, you might want to grab a seed bred for that exposure. I tossed a few pebbles on the bottom of each galvanized mini tub for drainage since there were no holes in them. I could've easily popped a few in, but I didn't really want water dripping all over the place every time I watered them. So I went with the pebbles. Again. 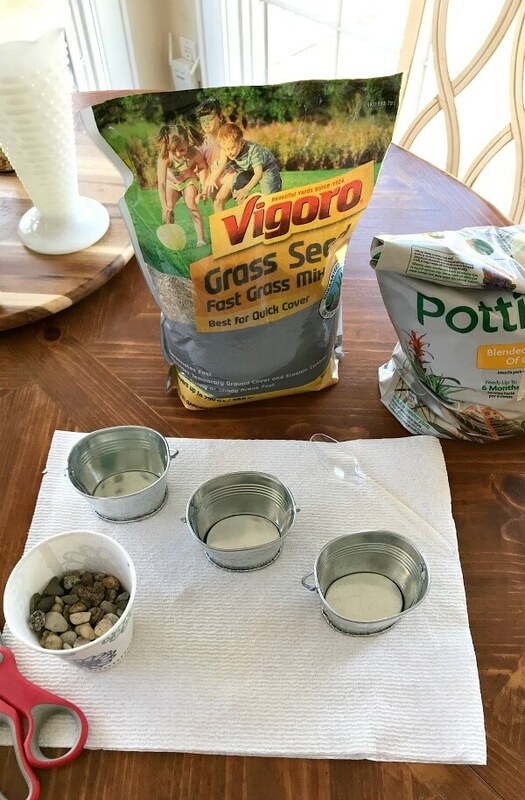 Next, I added the potting mix, a full layer of seeds for thick growth, and then I covered them up with more soil. I watered them ~ and crossed my fingers that my pots wouldn't leak ~ and set them in a sunny spot. Thankfully, the pots didn't spring leaks and in a few short days, I had the glimmer of grass! I love quick and easy results. 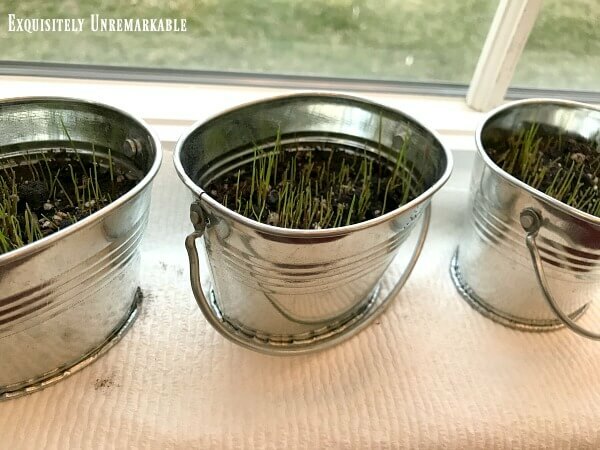 The grass grew pretty steadily and in no time, I had three little tubs full of long, lush, green grass, ready to decorate my kitchen. Of course, I don't like mess, so everyone got a haircut before I placed them in the window. 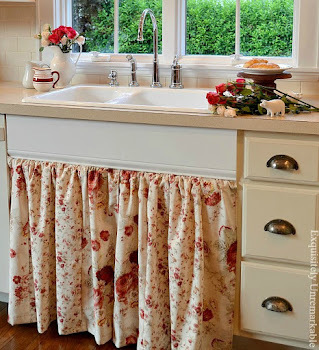 They look so perfect perched behind my farmhouse faucet and skirted sink...and even though it's still winter coat weather outside, they make it feel like a warm and sunny spring day inside. Best of all, with a sprinkle water a few times a week and the appropriate amount of sun for my seed choice, this grass will keep on growing despite my mud colored thumb. It's that hearty. Yes, yes, those teeny tubs cost me a little more than I wanted to spend, but I think the results have made that mini pot splurge totally worth it. And you can be sure that this time, I won't lose track of them. How do you feel about grass growing inside? Thanks so much, Jeanine! I was excited to have them back on my windowsill again! Just darling. They would look cute with some colored eggs nested in them at Easter. I totally agree, Lorri! I think I have a few decoupaged ones in my craft closet that will fit! How adorable, Kim!! 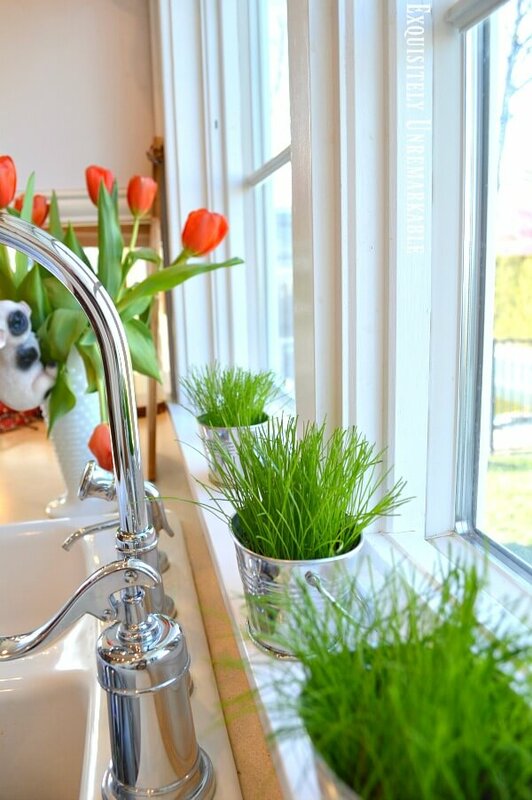 I never thought of growing grass indoors, but it looks so cute on your windowsill! Great idea Kim! 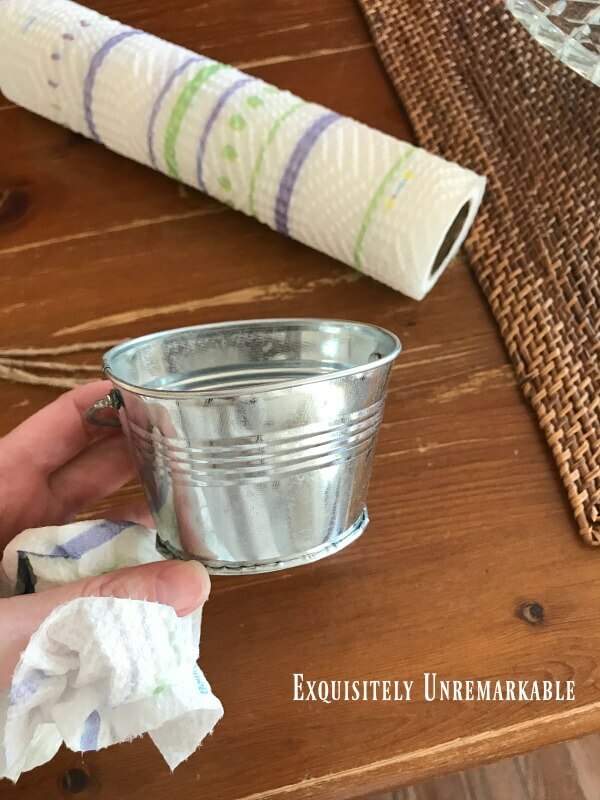 I'm sure those do look fresh & pretty on your windowsill & when I think about throwing away some little galvanized mini tubs b/c I couldn't figure out what to do with them! Head slap! Oh well...can't save everything, right? It's always the things we toss that we decide we need...happens to me all the time! Now, go toss some Easter eggs in there! and maybe a tiny porcelain rabbit or two! How delightful. Thanks Barb! Great idea...and very festive!! These are cute. I have to agree that you need some little Easter eggs or bunnies hanging out in the grass. I need to get decorating right away…eggs and bunnies in the grass, coming right up!! These are darling, Kim. This is one of those projects I keep meaning to do--thanks for the reminder! Those are the most adorable little buckets! 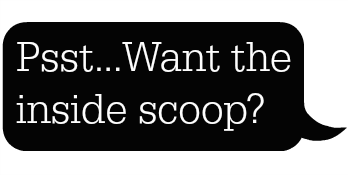 I'd buy them, too, even without knowing what in the world I'd use them for. What a fantastic idea for Spring. :-) I am pinning. 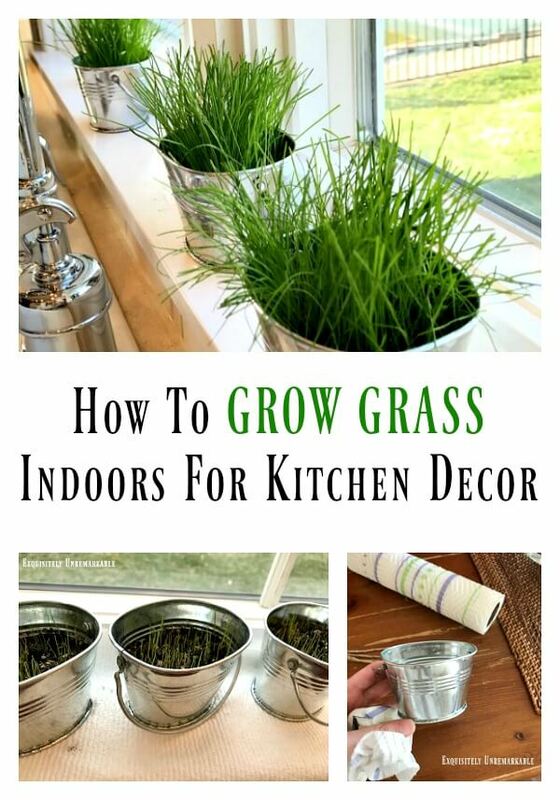 I never thought of growing grass inside like this! Love this idea. Your window seal looks so pretty and fresh with the pretty green grass. I think those are just too cute and a great idea! Something I've never understood though is why grass will grow on concrete and not in my yard where there is dirt?! Frustrating! Maybe growing some inside will ease my frustration! I love it! Love and hugs! Hi Kim, oh wow I love the way those buckets with the grass looks so stinking cute! I will have to visit a dollar store around here for something similar and plant grass. It looks great in the kitchen and plus so easy to plant! Hope you have a nice week. How cute. You could actually glue some felt on the bottom to keep them from rusting or leaking on the windowsill. I agree, some tiny eggs and a chick or bunny for Easter. Dollar Tree had some miniatures and a three pack with a tiny rabbit. Awww Kim, what a lovely way to bring Spring inside. I was wondering, does it smell like you mowed the lawn when you give them their haircut? I think I'll share this with my granddaughter. She is having her room redone for her 13th birthday and recently told me should would like to have some plants in her room. This looks like something she could handle:) We used to grow grass seeds in egg shells at Easter time in my 2nd grade classroom...the kids always laughed when we talked about giving them haircuts!!! Thanks for dropping by my blog and leaving a comment. I always love to "chat." Fantastic idea! Very beautiful tulips. Hugs Kim.